Almost every driver in the United States knows that it is really dangerous to drive while texting and as many as 94 percent of survey respondents report that they are in favor of banning texting for those behind the wheel. 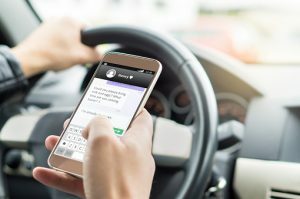 Distracted driving accident lawyers in Portland, OR know that the risk of an accident is actually 23 times greater in situations where a driver is texting and that texting is considered to be as dangerous as driving while impaired. Yet, even as most drivers agree that texting should be banned because it is dangerous, many are choosing to text anyway. Researchers from Kings College, who found that four out of five college students were texting and driving, hypothesized that the reason so many drivers are texting is because the drivers believe they personally are exception to the rule that texting is dangerous. Other evidence, however, indicates that people may be just picking up the phone out of habit. Why Are So Many People Texting and Driving? According to the Boston Globe, the human brain is hardwired to respond to certain cues – called triggers – with virtually automatic actions. This happens because people form habits in order to be more productive and avoid wasting brain energy. The habit of getting up and brushing your teeth in the morning is one such example of a habit. When the alarm goes off, you may stumble out of bed and reach for your toothbrush like you have done a thousand times before, all without really thinking about this process because it is automated. Habits form and the body learns to respond in programmed ways when the same thing happens over and over in response to the same stimulus. Some researchers believe that this is what is happening with smartphones and texting. To assess how people use their phones, 136 test subjects had their devices outfitted with software that tracked their usage over a six-week period. The researchers found that most phone users interacted with their phone at least 60 times over the course of the day, often in repetitive ways and performing simple tasks. The phone thus became a habit and when a user was confronted with a trigger – like a text message alert – the user grabbed the phone virtually automatically and navigated to the correct screen. Since phone use is habitual and automatic, a driver who has his phone in the car is very likely to respond to the trigger even if he’s driving at the time. This is especially true since the prefrontal cortex that is responsible for inhibition is occupied by the task of driving. This makes it even harder for the motorist to resist temptation and not check the text. If distracted driving is indeed caused by bad habits, this means that motorists who are committed to safety can work to develop new good habits to replace the bad ones. Drivers should make it a point to always turn their phone on silent and put it out of reach before getting into the car, so there will be no temptation to text while behind the wheel. This good behavior of switching off the phone can, over time, become customary and something you do automatically when getting in the car to drive. A distracted driving lawyer in Portland OR can help if you or a loved one has been injured in an accident as a result of a driver who was texting while driving. Contact Zbinden & Curtis today at (503) 287-5000 for a free case consultation.